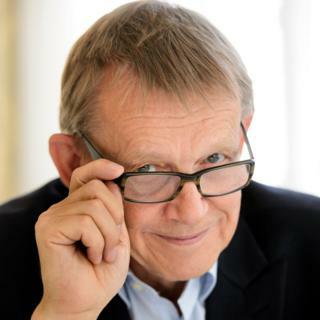 Hans Rosling, the Swedish professor who made global health statistics compelling viewing, died from cancer in February. Co-founder of Gapminder.org, which continues his work, he was enthusiastically trying to change old-fashioned notions of the world even as his illness took hold. In his final BBC interview - for the BBC World Service series Economic Tectonics - the statistician highlighted five key ways that demographics are shaping the world around us. Why do I as a professor from public health speaking about health and demography get invited to Goldman Sachs [and] all these big banks around the world? Because I tell them I can see on my screen when economic growth comes, before you can see it. In the past, economic growth was driving demographics, and now it's the other way around. First, I see decent life coming and I see children born-per-woman drop. I see the two-child family, and I see the economic growth starting in Vietnam, in Thailand… not only in China. And this change is coming, so if you want to know where to invest in Africa go and look at demographics. Governments can't run bedrooms. Bedrooms run the world. If you have countries where the fertility rate is coming down, just segmentise the population. Look at the most educated 20% in Ghana, in Tanzania, in Ethiopia: you will find two to three children per woman. You will find an emerging China in Africa. Go there to invest if you want to earn money, if you want to have nice pensions when you retire, place part of your capital there because there you will see fast growth. Africa is still growing, and there's such a difference within Africa. Some African countries are doing great from different levels: Ghana, most of Ethiopia, Tanzania. They are doing great: better schooling, better health, contraceptives being available. Other tragic examples: Central African Republic, Congo, civil wars; north Nigeria, very risky, troublesome. They are delayed. They need jobs. If they get jobs, you will get stable countries, and you will get economic growth. But there's an old vision of over-population and population causing disastrous environmental effects. If we look into the middle of this century, and if Africa makes it - stability, economic growth, social progress, rights for women, stable government, they get two child families - then they will be a burden on the environment. So an Africa that is successful will consume much more in 2050 than an Africa that is not successful. That will be a problem further on even if you manage to get down the population growth rate and Nigeria will level off at half a billion instead of one billion, Africa will level off at two billion instead of four billion. That doesn't mean that the environmental actions can rest. It's the other way around. Then, it's more urgent to take action because the rapidly successful two and a half billion in Africa, they will be a greater burden because they have money, they consume, they want bathrooms, they want refrigerators. The consequences of this are two possibilities - either those who work have to pay higher taxes or people have to work longer. Our former prime minister was bold. He told the Swedes you have to work until 75. We can't have a period between 65 and 75 where people play golf. Look at this as an opportunity. Many young couples work intensively to take care of kids, to have a professional life. The grandparents can come in. They can be more active, they are healthier, you know. There's a lot of ways in which this healthy old group of people can make a very valuable contribution to society. Whether it will be done non-monetary, to the tragedy of the minister of finance, or whether it's done by working and bringing in taxes for the greedy minister of finance, that's another thing. But it's open. It's a new situation because these older people are healthier. The period of life when you are disabled and sick and blind and cannot work, that has not increased, it has just been delayed. There is a problem with diseases like dementia and so on that takes out many healthy years, you know, but mainly there is an opportunity in this and it's just that the old systems have to change. What you see in Asia now is an amazing similarity from Japan, South Korea, the coast of China, Taiwan, Thailand. They are panicking in Singapore because the babies per woman is diving down to one. Taiwan, which we know as a country without [a] Communist party, they have one child per woman without any government policy, and China actually has 1.6. So why don't we get more babies there? I got the answer during a dinner in Hong Kong. I had lectured for a bank, and at the dinner I ended up next to the young banker who was extremely successful. She was 37 years old. She told me everything about financial trends in Asia and we got friendly with each other. So at the dessert I asked her: "Do you have a family?" "Oh no," she said. "I'm just working. I'm working all the time." But I pushed on because I'm curious and said: "Do you want to have a family?" And she leaned backwards, looked out of the window that was the Bay of Hong Kong outside, and then she said with a smile: "Yes, I'm thinking about children every day. It's the idea of a husband I can't stand." I like it when one phrase can catch a trend in a whole part of the world. The educated, skilful women in Asia, from Japan to Singapore, in different political circumstances, they have been accepted and they made their way to the labour market, but they are still oppressed by old-fashioned values that they should take care of their husband and their parents-in-law. Could migration solve the world's problems? My best friend and former PhD student in Tanzania was annoyed by immigrants because a Kenyan got a job he hoped his son would get, because the Kenyan had quite good qualifications on their education system. You have today immigration in Africa from Europe because African countries are needing skilled professional people. Look at Portugal - the Portuguese are going back to Angola and Mozambique, so migration is at all skills levels. Some very skilled people need to do their work in different parts of the world, and the people at the lowest levels will also go and seek opportunities. Many people who have a big heart and haven't thought so much they may think that Western Europe can solve the problems of the world by receiving all poor people and all refugees. That won't work. I think it's good that we receive many refugees, but I'd rather have them coming with their families together rather than forcing them out on these dangerous trips where they lose all their money to criminal organisations. If we can manage migration in the world, it can benefit the person who migrates with their family, the country from where they come and the country to where they go. Economic Tectonics: Demography will be broadcast on the BBC World Service on 16 March from 02:06 GMT, You can listen or subscribe to the programme podcast.